The Antarctic Biennale was conceived by the artist Alexander Ponomarev as a cultural exchange with the continent’s scientists and support staff. 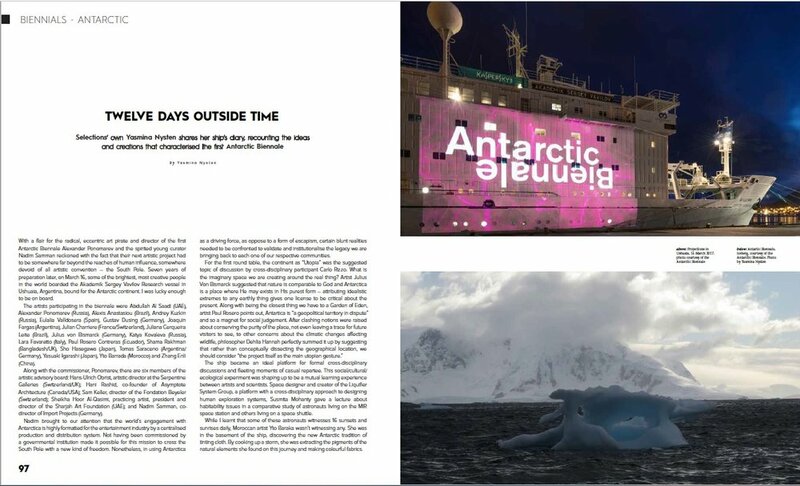 This independently funded project – brought artists, architects and other thinkers down South – confronted the resident elect with visions of Antarctic enterprise that they may not recognize, and attempt to draw out the implications of the Antarctic experience that go undocumented. Through exhibitions, performance and dialogue, the project will pursue an expanded Antarctic imaginary. The Antarctic Biennale was held in Antarctica in 2017 aboard international research vessels. Juliana Cerqueira Leite contributed two works to the Biennale. Vestibule a site specific video installation that focuses on the journey between Ushuaia and the Antarctic Peninsula, one of the roughest bodies of water in the world: the Drake Passage. 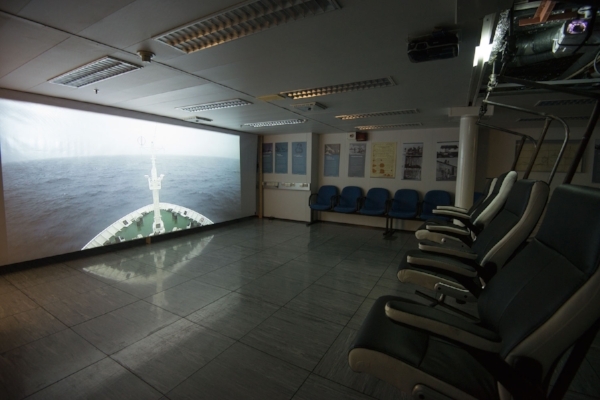 The installation included a large-scale live projection of footage from a CCTV camera mounted above the bow of the ship filming the horizon and view from the front of the ship continuously. This video could be watched while sitting on one of four custom motion-stabilized chairs. Hanging free of the ship's roll and pitch the chairs appeared to move within a still room when in fact they were still and the room in constant motion. The four chairs and the horizon appeared to move in synchrony. Projected into the room the horizon seemed to pitch right and left, sink and rise, while in fact it was the ship that tilted and rolled. This effect is best seen in this short piece of video documentation here. Additionally the biennial commissioned a new video work which premiered aboard the ship. This 30 minute video cycle is titled Vestibule - Epicycle. To produce this work Juliana Cerqueira Leite worked with a group of amazing dancers, actors, survival training experts at Survival Systems Inc. and Jennifer Kellow, Alexander Technique instructor to produce this short film.